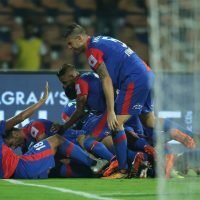 Bengaluru: Udanta Singh fired home an 87th minute winner to light up the Fortress as Bengaluru FC beat Delhi Dynamos 1-0 to go three points clear on top of the table and keep the Blues’ unbeaten start to the Indian Super League, intact, at the Kanteerava Stadium, on Monday. Skipper Sunil Chhetri marked his 150th game in a BFC shirt as his side fought tooth and nail until the final whistle to get the better of a stubborn Delhi side. Delhi could have gone ahead in the 30th minute if it hadn’t been for Gurpreet Singh Sandhu’s making himself big to deny Lallianzuala Chhangte from a one-on-one situation. Encouraged by the threat they put the Bengaluru defence under, the visitors attacked with confidence and it needed more of Sandhu’s quality to keep them at bay. Earlier, Cuadrat chose to start with a shape that seemed like a 4-4-2 with defender Rino Anto being handed his first start this season. With no Dimas Delgado (suspended), Nishu Kumar moved up on the left in midfield, while Chencho Gyeltshen had Chhetri for a partner in attack. 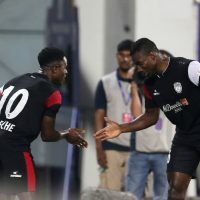 Bengaluru came close as soon as the half resumed when Udanta Singh played the perfect cut-back for Chhetri, but the skipper’s attempt to stroke the ball into the far corner was disappointing by his standards. Sensing the need to shake things up a little, Cuadrat brought on Erik Paartalu for Rino Anto, prompting Nishu to return to his familiar position at left-back. A second change was made soon after with Semboi Haokip replacing Gyeltshen as the Blues began showing far more purpose than they did in the first half. 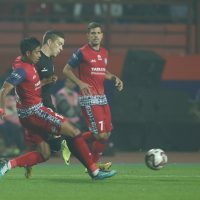 Delhi, who were keeping things at the back tight, lost possession after Haokip pressed Gianni Zuiverloon, stole the ball off the Dutchman and picked Udanta. The winger lobbed the ball over the defence to pick Xisco Hernandez’s run perfectly, only for the Spaniard to scuff his attempt on the volley. With less than five minutes left on the clock, Semboi pressed Zuiverloon once again, this time in an attempt to find space to get a shot away but instead the ball bounced away from goal towards an incoming Udanta, who found himself in space. With time to compose himself, the winger sent a shot goalward that took the slightest of nicks off Marti Crespi before heading towards the bottom corner and shaking the net off the upright to send thousands of BFC fans into a frenzy. 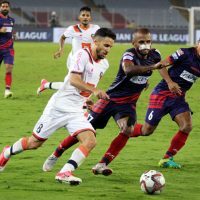 Bengaluru will next face FC Pune City in their first reverse fixture of the League season, at the Kanteerava Stadium, on Friday. Bengaluru: Bengaluru FC completed their quota of foreign signings and finalized their squad for the upcoming season with the addition of Spanish winger Eduardo ‘Edu’ Garcia Martin, the club announced on Saturday. 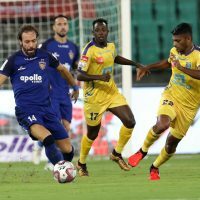 Having penned a one-year deal, Edu becomes the eighth overseas player and the fifth Spaniard in the squad for the Blues’ maiden season in the Indian Super League. Bengaluru: Bengaluru FC have added more firepower to their frontline with the signing of Venezuelan International striker Nicolas ‘Miku’ Ladislao Fedor Flores ahead of their debut Indian Super League season, the club announced on Tuesday. 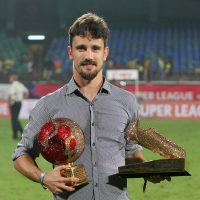 The 32-year-old who signed a two-year deal, arrives to Bengaluru from Spanish side Rayo Vallecano with whom he spent the last two-and-a-half seasons. The 6’ 1” attacker will team up with Spaniard Braulio Nobrega at the front and becomes the Blues’ seventh foreign signing for the season and the first ever South American player at the club. Born in Caracas, Venezuela to a Hungarian father and a Venezuelan mother, Miku began his football career in Spanish powerhouse Valencia’s youth system. Turning professional in 2004 with the Mestella-side, the striker turned out for CD Alcoyano (2004-05, 2nd B), UD Salamanca (2005–06, 2nd B), Ciudad de Murcia (2006, 2nd), Valencia ‘B’ (2007, 2nd B), Gimnastic de Tarragona (2007–08, 2nd), UD Salamanca (2008–09, 2nd) in the Spanish league system. His highlight during this period was striking 18 goals in the promotion winning campaign at Salamanca during the 2005-06 Segunda ‘B’ season. The striker returned back to parent club Valencia for the 2009-10 La Liga season, before moving in the heart of Spain to Getafe. His four-year spell with the Madrid-based club saw him amass 26 La Liga goals in 90-plus appearances. Miku also had short loan spell with Glasgow-based Celtic FC in 2012-13 where he won the Scottish League and Cup double. The following season, the Venezuelan moved out of Europe for his first spell in Asia where he represented Al-Gharafa SC (2013-15) in the Qatar Stars League. 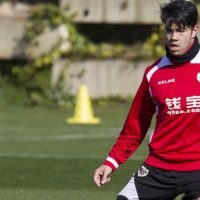 In January 2015, Miku returned to Spain to join Rayo Vallecano, another Madrid-based club. The striker settled in quickly and began firing all guns blazing in the 2015-16 season. In February 2016, he became the first Venezuelan to score in four consecutive Spanish top flight matchdays, winning La Liga’s Player of the Month award. That season Miku netted nine times and assisted four goals in 22 appearances for Rayo in the La Liga finishing their joint second-highest top-scorer in the league. 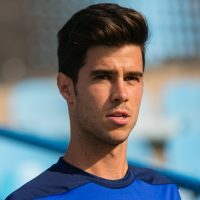 At the continental level, Miku has represented Celtic in the UEFA Champions League while playing in the UEFA Europa League for Getafe and Valencia, also scoring a hattrick in the competition for the latter. A full international since 2006, Miku has 51 caps for Venezuela and has scored 11 times, most notably against Brazil in the during the 2015 Copa America in Chile. The striker also helped his team to a fourth-place finish in the 2011 Copa America held in Argentina. Interestingly, the striker has already played in India as a part of the Venezuela team which faced Argentina in an International Friendly in Kolkata back in September 2011. Pune, 21 August 2017: – Strengthening their squad further, the Rajesh Wadhawan Group owned Indian Super League club FC Pune City today secured the services of 2016 Indian Super League golden boot winner Marcelo Leite Pereira a.k.a. Marcelinho. The Brazilian winger who has plied his trade in Spain, Greece & Italy represented Delhi Dynamos FC last season. In his 15 appearances, the South American scored 10 goals and made five assists. In his career spanning almost a decade, Marcelinho has represented Atletico Madrid B, Getafe B, Greek clubs like Skoda Xanthi F.C., Atromitos Athens, Kalamataamong others.